For Mimi Music, Komplexx (Poolside Recordings / Silhouette Noir) has delivered a melodic techno / progressive crossover with haunting vocals. This moody tune is deep yet melodious and builds beautifully. It’s just one of those tracks that works, with its genre-crossing coolness and excellent production. For the non-vocalists, there’s also an instrumental version.The first remix is provided by our lovely house-specialist Sascha Dive (Deep Vibes, Cocoon, Raum). The German master turns the original into a brooding techno affair which is driven by thumping bass and sparse percussive elements. The remix keeps building until there’s nowhere left to hide, turning the track into an absolute floorfiller! 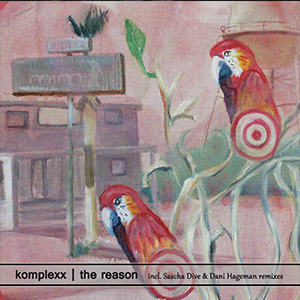 Next up, Komplexx provides his own “dub exxcursion”. The track has a menacing and obviously dubby vibe full of dusty hi-hats, loads of echoes and a haunting synth-line which keeps evolving. These all ride along perfectly with a chugging techno groove. You’ll soon be lured into a dark realm for a seemingly never-ending trip into all things deep. The package is rounded off perfectly by Dani Hageman. He delivers a tough house rework which utilizes the vocal to full effect on top of a bone-dry groove. And, for the instrumental heads, there’s also a dub version of his Deeptrip mix.